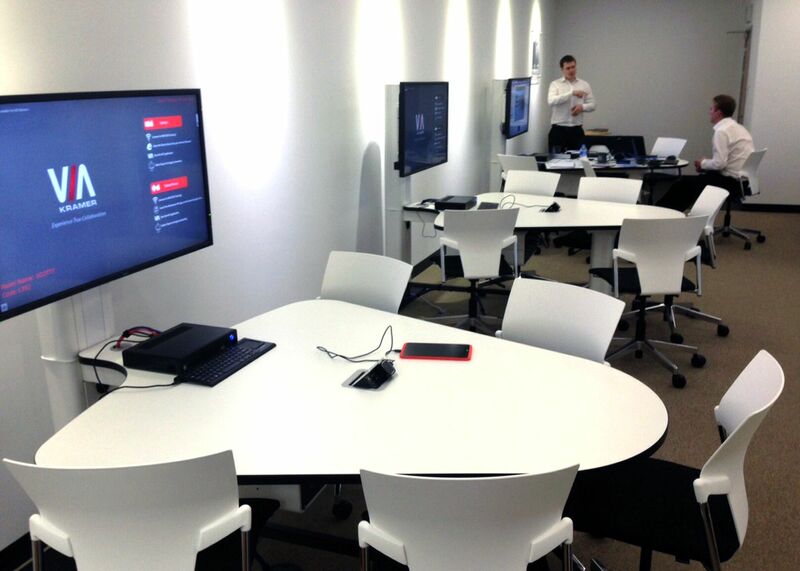 The European Training Centre for Kramer has been setup with a complete suite of Dalen products to facilitate complete classroom and group working. and systems through modern group focused teaching methods. The single most important thing to note about the training room is the way it is laid out with 3 “Huddle pods” each seating 5 participants, rather than in a traditional classroom style. The huddle pods are bespoke SYNERGY Plectrum Collaborative Tables which allow each group to work at their own pace on identical or differing tasks. It also allows for conventional teaching using a large 85” central display in the room as well as the 42” displays on each Synergy. The image on the main display can be relayed to each of the SYNERGY’s when the teacher wishes to adopt a more didactic style. When the teacher wishes to show the work of one collaborative group to all the others, he or she can equally relay that group’s screen to the main display and/or to each or all of the other pods. Each table can work independently of the others. Each participant can connect wirelessly to their table through the VIA Collage and can additionally share materials using integrated wired connectivity. Each table also has its own tablet running K-Touch for local control. The use of the VIA Collage means that participants don’t just work individualy on their own laptops, but can actively collaborate on projects together. Different users can collaborate by working on the same documents at the same time. pods to be sent to the main 85” display and to all the other pods. The Key to the success of the room is the way it deals with a vast array of teaching styles and methodology by using flexible, technology integrated furniture and systems to facilitate the delivery of ideas and learning materials. By simultaneously focusing the instructor and the students on what is important to the learning at the appopriate time the combination of SYNERGY tables and Kramer’s systems improve learning outcomes.